International business expansion provides diversification, revenues, and jobs for individual firms and the economy as a whole. The NAITA Global Trade Award honors existing local businesses and organizations for their dedication in pursuing and penetrating global markets. 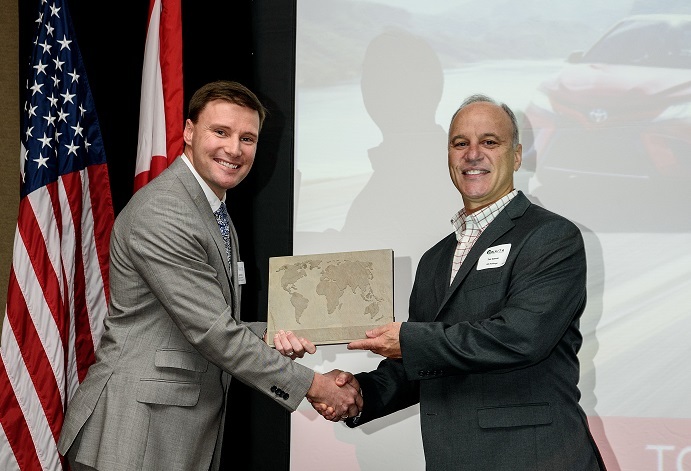 By recognizing these efforts, NAITA hopes to encourage others to explore and/or expand their international business and to strengthen the network of businesses involved in international trade. 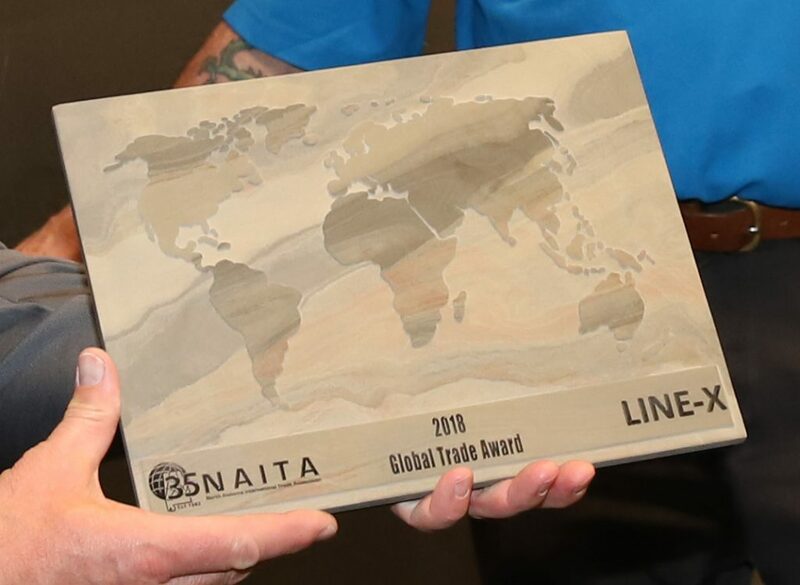 The entity selected for the NAITA Global Trade Award will be recognized at the Annual World Trade Day Luncheon, and will be profiled in the NAITA Trade Connection enewsletter. The recipient will also be invited to present a program at a NAITA meeting or International Business Interchange. 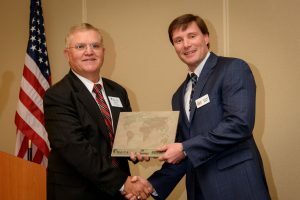 When applicable, NAITA will work with this recipient to complete an application for the “E” Award which is designated by the President of the United States and is the highest honor an American firm can receive for its exporting activity. 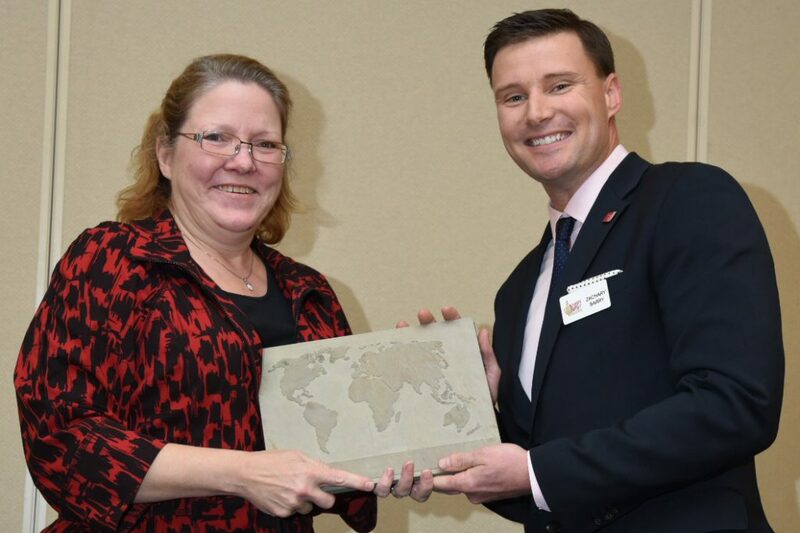 John Hamilton, NAITA President, presents 2016 Global Trade Award to Zach Barry, Aladdin Light Lift, Inc.
Zach Barry, Aladdin Light Lift, Inc., 2016 NAITA Global Trade Award Recipient, presents 2017 Global Trade Award to Lynn Leeper, CEO, AZ Technology. 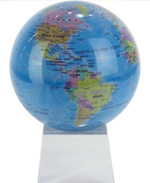 Click here to download the NAITA Global Trade Award Application. For further information, please contact Anne Burkett, Madison County Commission International Trade Development Center, 256.532.3505 or naita@naita.org.